Learning isn’t the same for every person; a teacher’s mission is to challenge students while also providing a safe and caring environment where everyone has the opportunity to succeed. 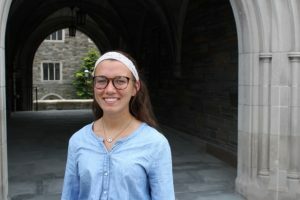 Elaine Estes’ ’19 Summer Scholar project is focusing on the pathways to and barriers within gifted education for English Language Learners (ELLs), with a special focus on Hispanic ELLs and those within the greater Philadelphia area. “One thing I’ve learned in my time as an education major and teacher candidate here at SJU is that student experiences and teacher experiences are radically different,” says Estes. A secondary education and Spanish double major from Oxford, Pennsylvania, who is also a member of the SJU Varsity Cross Country and Track and Field teams, Estes is conducting a literature review of scholarly studies on educational opportunities for gifted and Hispanic ELL students. She is creating a survey for and conducting interviews with local gifted program coordinators or school administrators in the Greater Philadelphia area. She will synthesize this information to develop recommendations for potential pathways for Hispanic ELLs in gifted education. Estes is a member of the SJU Varsity Cross Country and Track and Field teams and has earned Dean’s List, Athletic Commissioner’s Honor Roll and A-10 Academic Honor Roll during her time at SJU. She was recently admitted to the University Senate as an at-large Senator for the class of 2019. Additionally, she is a member of the University Singers choral group and the Spanish National Honors Society, Sigma Delta PI. She plans to use the knowledge she gains from her Summer Scholars research as she works toward becoming a teacher.